Cardinal Luis Antonio Tagle of Manila offered a challenge to young pilgrims at World Youth Day (22-27 January 2019). Hundreds of thousands of young pilgrims had gathered in Panama, many of whom from the small Central American countries nearby. “If the world that we elders have left to you is not as just, as loving, as peaceful as you would like, learn from our mistakes. You don’t need to follow our bad examples; learn from our good examples!” he said. The remarks came after hundreds of young volunteers donned wireless headphones as part of a ‘silent play’ exploring Pope Francis’ vision of the culture of encounter and Caritas’ global Share the Journey campaign. Each was encouraged to meet a new person and explore their lives and losses, joys and hopes – all in complete silence. The event ended with a Share the Journey walk through the centre of Panama City to greet the Holy Father as he passed pilgrims in the Popemobile. Hundreds of young people shouted, sang and took selfies along the route, to the bemusement of local onlookers. Pilgrims from more than twenty countries across all regions of the world came together for the afternoon and the closing session was standing room only at the historic Teatro Anits Villalaz as young people squeezed to hear about migration from Irene, a young Nicaraguan refugee and Jorge, a young campesino from Panama. It is understandable that people in host countries should feel fearful, said Irene, but to overcome the fear of the migrant, we must “look to their humanity” and recognise their rights. “We need to speak about migrants and not exclude them or treat them as if their rights are not important”. 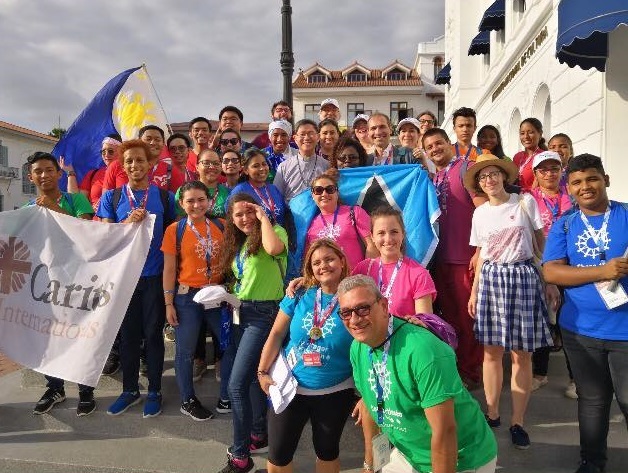 “Being part of this gathering, of Caritas, helping the migrant and the environment, we put in our drop of water to form an ocean, little by little we will change the world,” said Jorge. Reflection from Daniel Hale Million Minutes Trustee and Head of Campaigns at CAFOD (Caritas England and Wales).